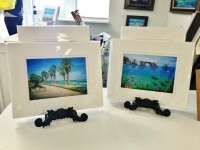 Welcome to Harbor Village Gallery, a satellite space of the Buenaventura Art Association! Art shows rotate approximately once a month, and the public is invited to all opening receptions. An Artisan Store contains affordable gift items made by members. Some members use the space in the gallery as their working studios. The Harbor Village Gallery sponsors occasional arts activities for families, as well as a Ventura County collegiate student art competition each year. Stop by to see the artists’ latest work and buy a unique piece of art to decorate your home!